Dhoni ripped the RCB bowlers apart into pieces with some belligerent batting. However, despite the criticism, Dhoni has shown an unflappable temperament and has appropriately answered his critics. He is the skipper of the Chennai Super Kings (CSK) in the Indian Premier League (IPL) and has captained the side with sheer authority. The franchise played their last game against the Royal Challengers Bangalore (RCB) and the veteran pulled out another match-winning knock. The game commenced with RCB racking up a mammoth target of 206 to chase down for the Super Kings. AB de Villiers mauled the CSK bowlers and helped the hosts post the massive score. During the run-chase, the likes of Yuzvendra Chahal and Umesh Yadav picked up some wickets and pushed the visitors back. When MS Dhoni took charge Chennai required 132 runs off 66 balls. The task wasn’t a cakewalk by any means and required a herculean effort to be accomplished. Dhoni had Ambati Rayudu at the other end, who played a brilliant hand. However, to the agony of the Super Kings, Rayudu was run-out courtesy a brilliant throw by Umesh. 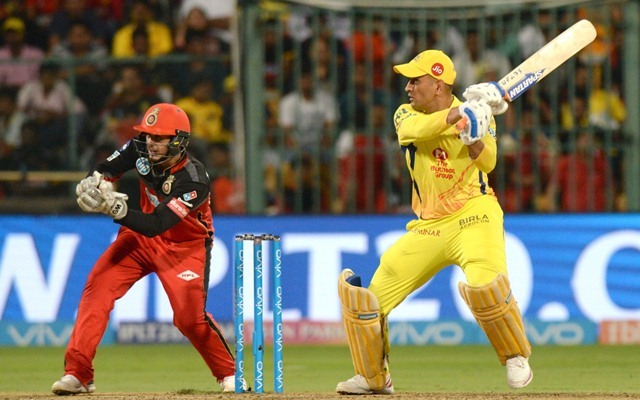 Nevertheless, MS Dhoni carried on in his own merry away and kept peppering the boundaries. Dhoni raced away to a whirlwind half-century in 29 balls and accelerated even more during the death over. In the last over Dwayne Bravo spanked a couple of boundaries and CSK required five runs off the last three balls. Corey Anderson, who bowled the last over, succumbed to the pressure as MSD muscled him down the ground to win the game for CSK. He eventually scored 70 runs off 34 balls with seven sixes. Following the knock, he has been showered with praises. From commoners to cricketers and from the entire nation, accolades and admiration poured in for the 36-year old. Virender Sehwag, the former Indian batsman, also couldn’t hold himself back and heaped praises on Dhoni. Kamaal hi karte rehte hain MS Dhoni. Brilliant again.